“Three Billboards Outside Ebbing, Missouri” is only Irish playwright Martin McDonagh’s third feature film in which he’s written and directed, but all of his films, including 2008’s poignantly tragic, wickedly droll crime-noir “In Bruges” and 2012’s gleefully depraved, cleverly self-aware “Seven Psychopaths,” have a way of bucking convention at every turn. Demonstrating yet another tonally deft balance and an ear for sharp dialogue that makes one wish we could all pull out quips like this on a dime, McDonagh's “Three Billboards Outside Ebbing, Missouri” is a barn-burning statement, pitch-black comedy, soul-searching drama, tragedy and morality tale about the lengths to which people will go when coping with loss and injustice. There’s simmering rage but also biting wit, catharsis and truth. 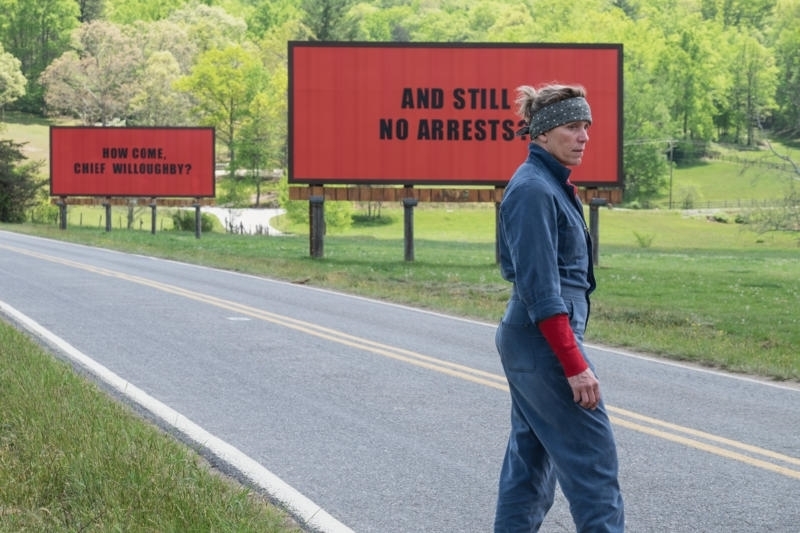 Seven months after her daughter has been raped and immolated, divorced, tough-as-nails Midwestern woman Mildred Hayes (Frances McDormand) finds three blank billboards along the road leading to her house. She marches into Ebbing Advertising and rents out space on the billboards with a taunting message that singles out Chief Willoughby (Woody Harrelson) whom she feels hasn’t done enough to find her daughter’s murderer. The billboards cause quite a stir in the small town, although Willoughby, who has been diagnosed with terminal cancer, takes it easier than most. Officer Jason Dixon (Sam Rockwell), on the other hand, is livid. When folks in town start threatening Mildred and even burn down her billboards, someone whom she least expects stands up to help her. 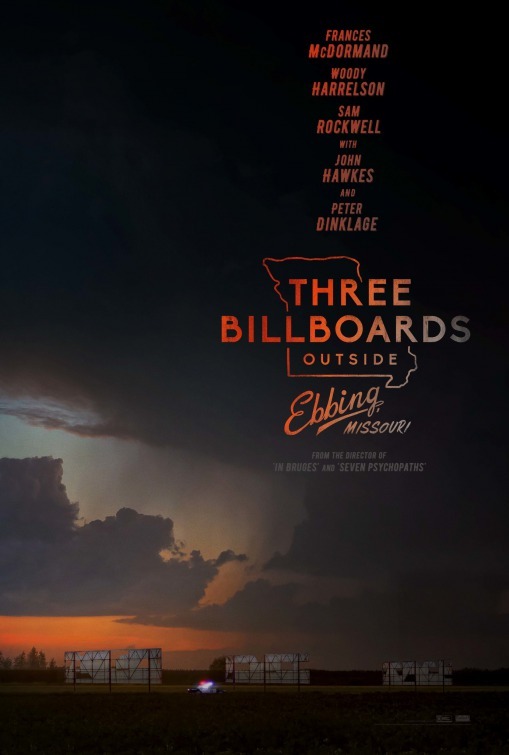 In a film like “Three Billboards Outside Ebbing, Missouri,” a blazing sense of caustic black humor courses through the story’s veins while maintaining a consistency with its characters who could easily be written off as a bunch of deplorables but are never plainly good or bad. Martin McDonagh wrote the script with Frances McDormand in mind, and based on her work on screen, one can’t imagine anyone else more right for the role. Next to 1996’s “Fargo,” this is her rawest, most dynamite performance. Fury incarnate, Mildred is a gruff, no-nonsense steam-roller of a human being, having zero fucks left to give and spewing vitriol when someone confronts her (she doesn’t spare the local priest, her dentist, or even a couple of kids at her son’s school when they provoke her). Even when she may go too far or come off self-righteous, the viewer feels her anger and pain, and McDormand is just a commanding force of nature. 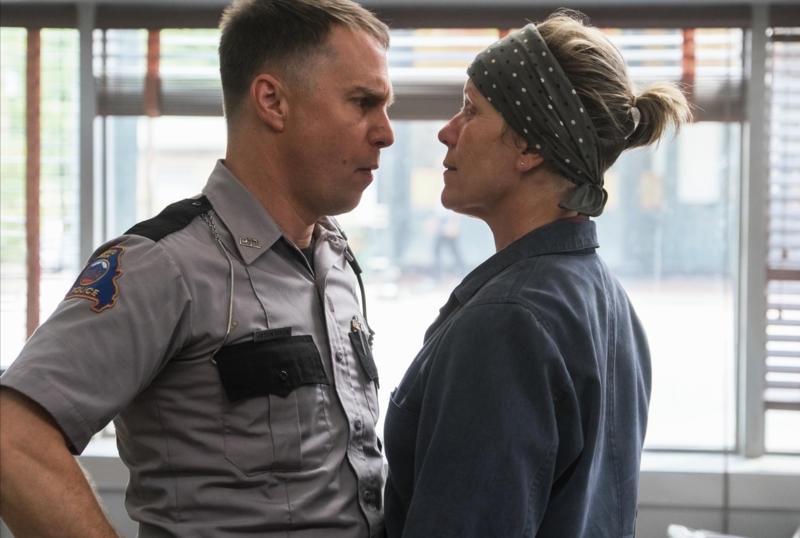 There are a couple of times where “Three Billboards Outside Ebbing, Missouri” goes for histrionics, but Martin McDonagh earns those moments with the situations in which the characters find themselves. His characters are flawed and interesting and not always charming, and the viewer’s sympathies keep changing as Mildred and Dixon, specifically, evolve. 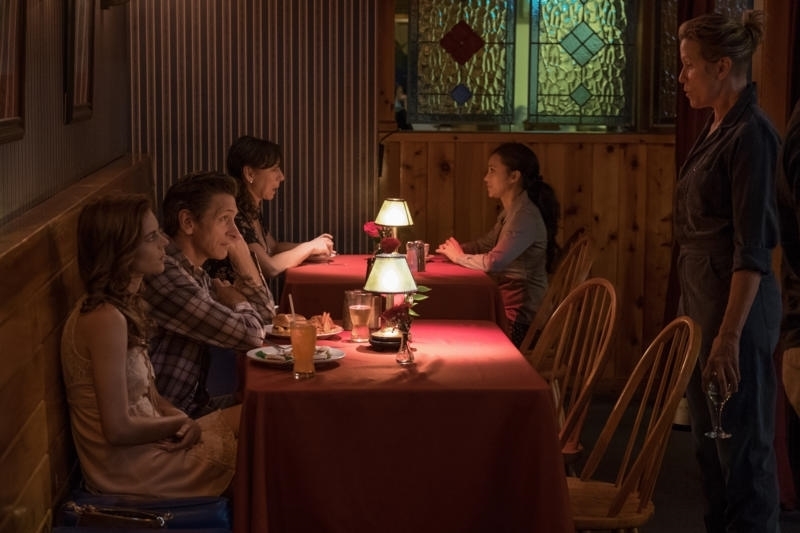 The screenplay is smart and unpredictable with shocking bursts of cruel violence, and as one comes to realize that the film will not be following rigid, conventional narrative beats, it keeps zigging where the viewer thinks it will zag. This isn’t a murder mystery or a procedural or even a revenge thriller, which may frustrate audiences when the ending comes, but let them be frustrated because it’s the perfect ending to a story that never lets anyone off the hook too easily, leaves characters asking themselves what to do from there, and holds no easy resolutions, just a tinge of hope that things need to get better, no matter if they go through with their final decision or not. “Three Billboards Outside Ebbing, Missouri” would be a terrific film no matter when it was released, but in this day and age particularly, its anger is even more cathartic.